Students Maria Bayona and Xiang Tang received the Top Paper Award Feb. 18 at the Latino/Hispanic Media and Marketing International Conference at California State University in Fullerton. (From left) President for the Association for Latino Media and Marketing Communication Research Federico Subervi, graduate students Xiang Tang and Maria Fernanda Bayona, Center for Hispanic Marketing Communication Executive Director Dr. Sindy Chapa, and Founding Director Maxwell Center for International Communications at California State University in Fullerton Dean Kazoleas. 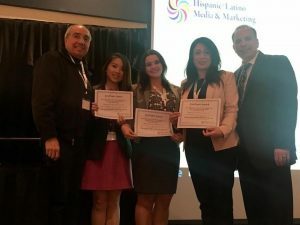 Los Angeles — Two Florida State University (FSU) graduate student presenters won the Top Paper Award at an international Hispanic conference in Los Angeles last month. The students, Maria Fernanda Bayona and Xiang Tang, presented their research on Hispanic and Asian coffee consumption in the U.S. at the sixth annual Hispanic/Latino Media & Marketing International Conference at California State University in Fullerton. Conference officials awarded them the top paper out of all participants. The two were among a group of 15 students from the Center for Hispanic Marketing Communication (the Center) at FSU, some of which also presented research. Bayona’s research was part of her capstone project to graduate with her Master’s in Integrated Marketing Communication and a Certificate in Multicultural Marketing.